Childhood joys often settle in the eyes of little fluffy creatures that capture our hearts, and for me no greater instrument for such possibilities resonated more than a small gremlin named Gizmo. As a child of the ‘80s, there were certainly ample opportunities to find comfort in the company of sympathetic movie creations – including Spielberg’s famous E.T. and George Lucas’ misunderstood Ewoks – but something about a cute furry beast with long ears and big brown eyes bypassed all others as a source of visual comfort. To me, he embodied every trait necessary in creating youthful wonder: innocence, clumsiness, fear of the unknown and a certain gutsiness that spilled over when a plot insisted a level of danger onto those he cared about. The adorable factor was the most minor of those facets but no less critical, and when one brought all of those qualities together in the figure of something so delightfully endearing, there was scarcely a moment where we could walk away from the experience not wishing he was real (or better yet, actually part of our lives). And that’s the truth even after one acknowledges the bizarre anatomical characteristics he comes cursed with. Throughout those early years of my youth, I often returned to Gizmo’s adventurous world not out of fascination for what occurred around him, but just for the chance to be reminded of his purity and conviction. Perhaps that was a facet of disillusionment I ought to have addressed much sooner than now. When a copy of “Gremlins” fell into my lap during a recent gift exchange, it was the first opportunity in almost two decades I had in returning to the little guy’s world of adventures; and because it presented a unique opportunity to connect with a facet of my own youthful naivety, I found allure in the possibilities. Little did I recall just what kind of movie actually surrounded those prospects. “Gremlins” may have once been about the charming possibilities of movie creatures with big hearts, but as an adult it fashions a reality that plays like the worst of Norman Rockwell’s nightmares: a world in which all the conventional undertones of holiday spirit are destroyed under the influence of a beastly host of monsters that do everything in their power to inspire chaos and disorder. How delightfully oblivious I must have been not to detect the gloominess of this fantasy. And yet there is satire here: a sense of silly but thoughtful consideration on the Christmas traditions and how easily all the relatable facades crumble as a consequence of simple illusions being so easily shattered. The story opens as a clumsy inventor Randall (Hoyt Axton) stumbles upon a pawn shop in the Chinatown of New York where he hopes to pilfer off some of his latest gadgets when he makes a startling discovery: a unique little creature known as a “Mogwai,” which rests comfortably in a back room of the store while whistling a sweet tune. What exactly it is and how it came to settle there are questions without answers, but Randall is so intoxicated by his utterly infectious presence (hey, who wouldn’t be?) that he offers to buy him. The shop owner, a wise but cranky old man named Mr. Wing (Keye Luke), refuses the sale; to him, the Mogwai is a very valuable animal that operates by its own set of rules, and it is the nature of civilized man to destroy or alter something so precious. Nonetheless, the Mogwai (named “Gizmo”) does in fact wind up going home with Randall though a series of obligatory plot circumstances, and he is gifted as an early Christmas present to his son Billy (Zach Galligan). Billy is a bank teller whose financial stability is helping his family through hard times of small town life during the frigid winter, and this miraculous little find becomes his reward of sorts, effectively setting up his youthful responsibility with the kind of ambiguous opportunities that often result in big problems in the movies. Key among the rules in keeping Gizmo safe and happy are three critical ones that are used as insistent foreshadowing: 1) Mogwais cannot be exposed to bright light, and sunlight will kill them; 2) they cannot be exposed to water in any capacity; and 3) they can never be fed after midnight. Because the characters accept the rules at face value without ever asking why, however, that allows the plot to indulge in convenient mishaps – at first with a jar of spilt water (which allows Gizmo to multiply in a rather swift but painful-looking manner) and then with their accidental after-midnight feeding (which causes the offspring to cocoon and then mutate into altered forms filled with sharp teeth, leathery skin and mischievous behavior patterns that would make the kids in “South Park” look obedient). Consider the movie’s backdrop. In their entirety, these events transpire completely in the framework of a small locale called Kingston Falls, which visually seems like a cross between the artistic sensibilities of Norman Rockwell and Thomas Kinkade. Upon deeper inspection, it also carries all those conventional visual and narrative details we come to associate with stories about the holidays: the obligatory wintry landscape where iron lampposts barely light the streets behind blankets of falling snow; the old Scrooge-like humbug (an old lady obsessed with money and cruelty played by Polly Holliday); a mute housewife (Frances Lee McCain) who engages in all the ordinary holiday pastimes, including watching “It’s a Wonderful Life” on a kitchen television while baking cookies; and the local bar where citizens exchange those silly or vulgar anecdotes that aren’t very funny unless you’re in on the joke. When the “gremlins” rise to the occasion of being the conduits for the destruction of these cornerstones, nothing is sacred; their incessant need to torture, torment and even cause the untimely deaths of various citizens of Kingston is presented with a gleeful sense of displacement, as if the movie is surmising that movie creatures also exist to destroy dependable traditions beyond the straightforward implications of a story. And by providing the movie with a climactic speech in which a character recounts a painful childhood memory of a parent’s death, it marries those thoughts with a serious conviction instead of a frivolous one. If traditions are made to be broken, then “Gremlins” may have indeed been a decisive moment in transitioning our young hearts from naïve displacement to the menacing acknowledgment of the real world. Does that make the movie a cynical one? Very much so, but not without some level of cheeky awareness. Director Joe Dante and writer Chris Columbus are deadpan in their goals but also do not overwhelm the movie in downtrodden sensibilities, either; you get the sense they are smiling behind the camera the entire time, thrilled with the vindictive nature of their little creations and almost in ecstasy over the notion that all of those dependable holiday clichés are being sacrificed without the slightest sense of sympathy. 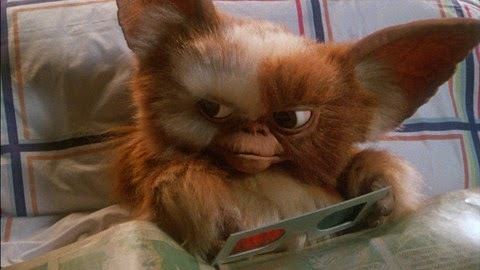 If “Gremlins” had been entirely about the depressing capabilities of those themes, however, would it have even bothered gifting us Gizmo, the starkest contrast of all? Would the filmmakers have made him so cute, so alluring and so charming, even in the aftermath of all the tragedy his existence causes? There are multiple layers of reasoning at work here – some of them harsh, some of them amusing, some of them incredibly devious – but it all comes equipped with a sense of humor that is remarkable, and our instinct to sneer in protest is undermined because no one involved takes these routes as part of some kind of unnecessarily cruel agenda.